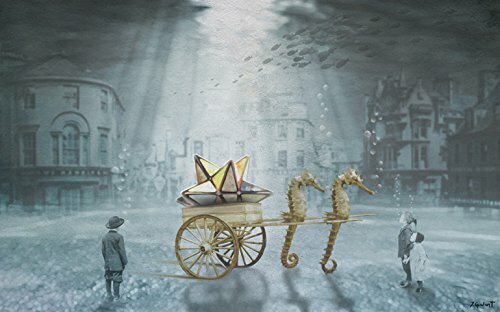 The Submerged Town of the Star Recuperator's Sea Horses by José Galant explores the ethereal nature of dreams and the subconscious through various surreal elements. Children stand aimlessly in a colorless underwater landscape, their conversation masked and displayed as mere bubbles. They are looking on in awe at a seahorse drawn carriage carrying a star shaped sculpture. Light filters down from above, spotlighting the carriage as the only source of color. This curious wall art spurs the imagination and is a reminder of childhood fantasy. This is a ready-to-hang This is a ready-to-hang canvas print with 100 year archival pigmented ink on museum-quality canvas. Actual dimensions may vary slightly from listed dimensions to preserve original proportions.